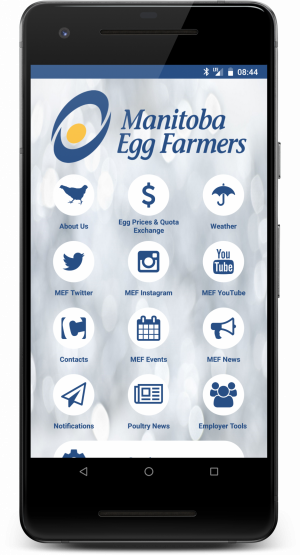 The Manitoba Egg Farmers Association has launched its mobile app for association members and provincial farming advocates. 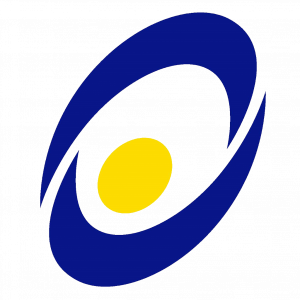 The Manitoba Egg Farmers (MEF) represents 170 regulated egg and pullet farmers across Manitoba and is an independent organization, funded entirely by egg and pullet farmers. The MEF mobile app is available for free on both iOS and Android. The Manitoba Egg Farmers Association are the third agricultural association to launch a mobile app for both iPhone and Android under the Canadian Agricultural Human Resource Council (CAHRC) app umbrella, or ASApp. CAHRC developed the Agricultural Smart-Association App (ASApp), a powerful smartphone app that helps agricultural associations engage their members, save money and generate revenue by providing self-managed mobile application services. The mobile app was built using 14 Oranges Info Grove platform, allowing CAHRC to develop and maintain mobile apps for its affiliate associations. In addition to Manitoba Egg Farmers, the Canadian Young Farmers Forum and the Canadian Honey Council have also launched mobile apps with CAHRC and 14 Oranges. The majority of the content in the Manitoba Egg Farmer mobile app is maintained by staff at the Manitoba Egg Farmers Association, while also receiving content updates from CAHRC in specific areas in the app. The mobile app includes access to CAHRC-provided employer tools, including the AgriHR Toolkit and other staff management services. The mobile app also links users to the national job board for agricultural work, either to find work or post new positions. As farmers spend a great deal of time out on the field, the app was built to provide crucial information regardless of a phone connection. Association members have immediate access to national level safety guides for agricultural best practices. The Canada FarmSafe Place (CASA) and the Emergency Plan section of CASA are available to app users without in the app while offline, perfect for farmers who spend the day away from home. 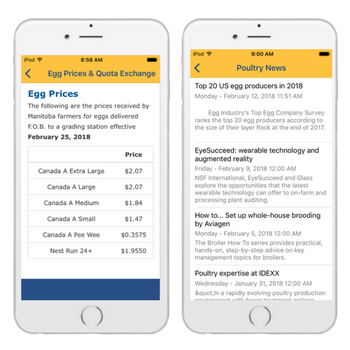 Users of the Manitoba Egg Farmer mobile app will have quick access to egg prices and quota exchanges month to month, important information for egg farmers. The MEF mobile app also updates members with agricultural updates, or “Poultry News” via an automated RSS feed. Other organizational advantages to ASApp are cost savings, as it retires traditional print and media approaches and brings newsletters, journals, and event programs right to the phones of association members – with all information easily updated by staff via the web interface. Finally, mobile app usage analytics and easy to administer member surveys help association staff receive insights about their membership engagement levels. The data collected helps staff understand what’s driving mobile engagement and find new ways to increase communication with members. Learn how easy it is to manage a mobile app today.